Singapore had been part of various Malay kingdoms in Southeast Asia since the fourteenth century, including the Johor-Lingga-Riau sultanate from the sixteenth to the nineteenth century. In the 1800s, the Johor-Lingga-Riau sultanate experienced a succession dispute where the younger brother, Tengku Abdul Rahman, was installed as the Sultan in 1812 instead of the heir apparent, Tengku Hussein. The British East India Company (EIC), which had been trying to set up trade settlements in Southeast Asia since the seventeenth century, made an agreement with Sultan Tengku Abdul Rahman in 1818 to secure the southern end of the Straits of Malacca. However, plans fell through as the Sultan eventually chose to collaborate with the Dutch, and the treaty was annulled. Without Sultan Abdul Rahman as its ally, the EIC turned to Tengku Hussein to set up a British trading post in Singapore instead. On 6 February 1819, Stamford Raffles, who represented the EIC, signed a treaty with Tengku Hussein and Temenggong Abdul Rahman (Prime Minister of the Johor-Lingga-Riau sultanate) to establish a trading post on the island. This and subsequent agreements laid the foundation for the development of Singapore as a key British trading post in the nineteenth and twentieth centuries. As part of the treaty, Tengku Hussein was recognised as Sultan Hussein Shah of Singapore. He and the Temenggong received an annual salary from the EIC, and the area of Kampong Gelam was allocated to the Sultan. Kampong Gelam (‘Gelam Village’), whose name is derived from the Gelam trees (Melaleuca cajuputi) which grew in the area, became the seat of the sultanate in Singapore. Before Singapore became a British trading post, Malay communities had settled on the river banks of Rochor River, near to Kampong Gelam. The Sultan moved into Kampong Gelam, built his palace and brought his whole family and hundreds of followers from Riau to Singapore. With the re-emergence of Singapore as a flourishing port in the 19th century, Kampong Gelam thrived as a trading and commercial hub. Ships from the Malay Archipelago docked along the coastline of Kampong Gelam. Communities of Bugis, Arab, Javanese and Boyanese descent from Malacca, the Riau islands, Java, Sumatra and Sulawesi settled within Kampong Gelam. Merchants trading in various products, including spices, textiles, gemstones and rattan, congregated in different parts of the district. Kampong Gelam became a notable printing and publication hub, attracting intellectuals and artists from the Malay Archipelago and beyond. It was also the centre for Muslim devotees from British Malaya and Dutch East Indies (today Indonesia) preparing to perform the pilgrimage to Mecca. The original residence for the Sultan took the form of a timber hut. With the cession of Singapore to the EIC in 1824, the EIC pledged to build a mosque for the Sultan and his followers. This resulted in the establishment of Sultan Mosque which was constructed beside Istana Kampong Gelam. 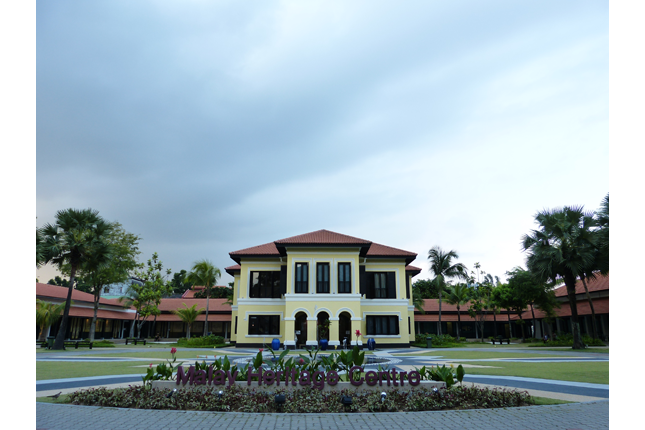 The present two-storey Istana Kampong Gelam was completed in 1843. It was commissioned by Sultan Hussein Shah’s son and heir, Tengku Mohammed Ali who later became Sultan Mohammed Ali Iskandar Shah, after he was recognised as the Sultan of Singapore in 1855. George D. Coleman is believed to have designed this building, although there are no sources to confirm this. 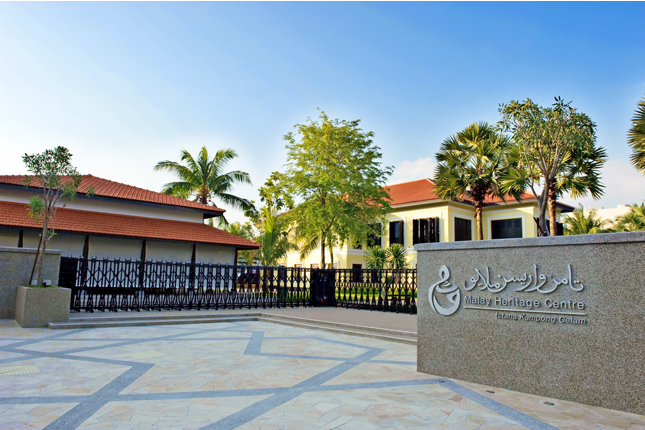 After Sultan Ali Iskandar Shah’s passing in 1877, Istana Kampong Gelam continued to serve as a family home for Sultan Hussein Shah’s descendants until the 1990s. 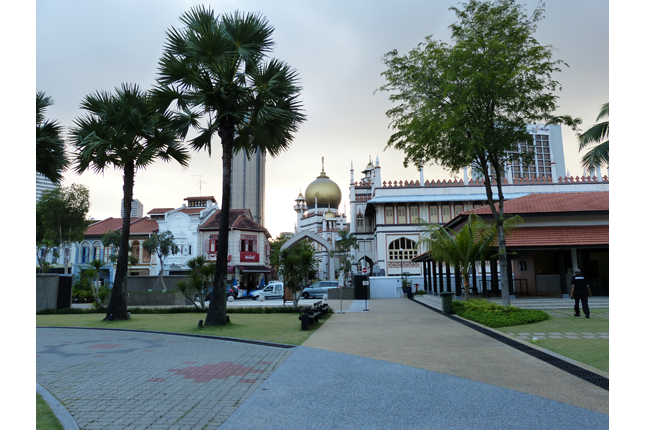 Over the years, it has hosted several meetings and events, such as royal weddings and tea parties that were organised by the Malay community. 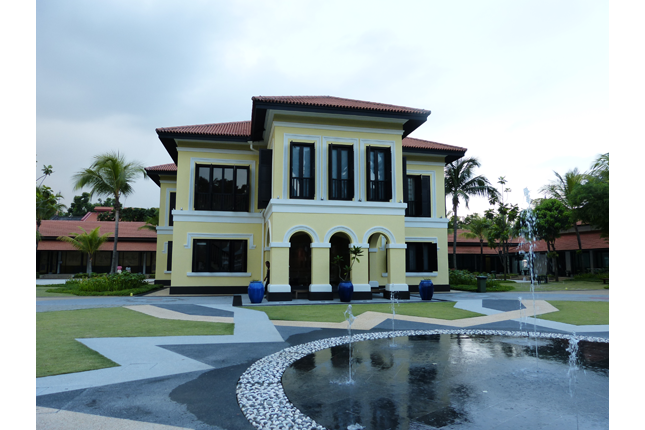 Similar to much of Classical European architecture, Istana Kampong Gelam was symmetrically planned, featuring classical elements such as round arches (found at the entrance porch), and pilasters of the Doric order. The residence was also adapted for the tropical climate, evident in the large pitched roof with projecting eaves for sun-shading and large timber-louvered windows for maximum ventilation. The building also exemplifies several features of traditional Malay architecture, aptly reflecting its function as the Sultan’s palace. The regional practice of constructing houses on stilts is echoed in a second storey supported by columns over the entrance porch. The large pitched roof has been likened to a defining characteristic of a Malay Limas (‘pyramidal’) House. The layout of the house corresponds to Malay house typology with the front hall (serambi) where guests were received, leading to the main hall (ibu rumah) which once connected to an annexe (rumah dapur), where the kitchen would traditionally be located. As early as 1993, the Government planned to develop Istana Kampong Gelam. 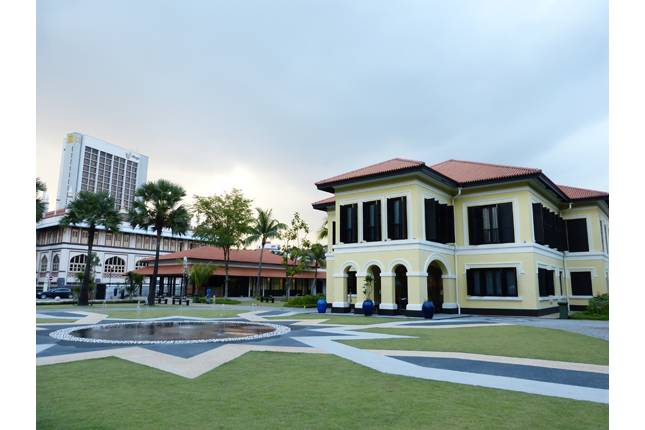 Six years later, plans were announced to convert the former Istana into a Malay Heritage Centre to showcase the rich arts and cultural traditions of the Malay community. 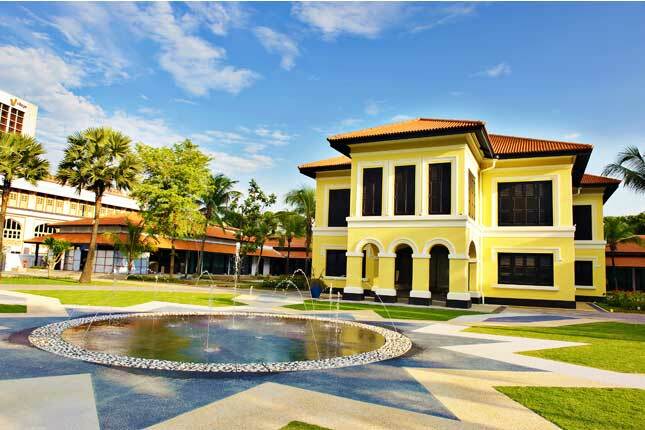 The building underwent refurbishment works between 1999 and 2004 and was officially declared open as the Malay Heritage Centre by Prime Minister Lee Hsien Loong in June 2005. 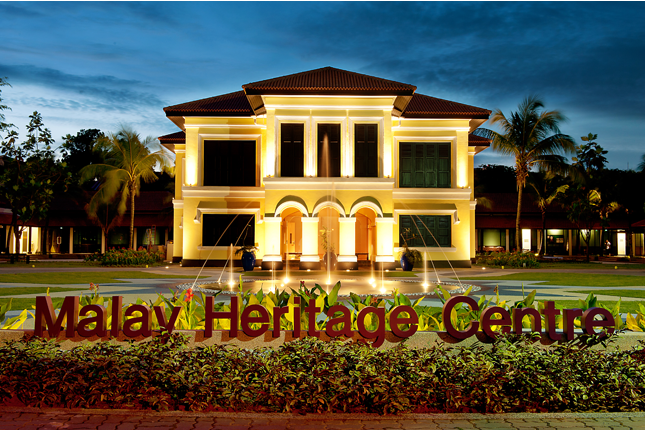 Today, the configuration of the Malay Heritage Centre honours the layout of the traditional Malay house with five permanent galleries.